Listen and subscribe on iTunes, Google Play, or Soundcloud. With Rubeo and Kittelberger’s playoff game finally scheduled for next Monday at 11:10 PM, Rubeo poses the question: what is the ideal day and time to play beer league hockey? Some guys like morning or earlier evening games to preserve their day or night while other’s, especially those with kids, like the late games. As long as there is enough time for a beer and some chirping with your team after, you’re all good. After discussing batshit crazy hockey parents last week, Schwartz witnesses it firsthand at his younger brother’s U18 AAA game. The Canadiens, Islanders, and Hurricanes are on the upswing in the East. The Sabres, Senators, and Penguins are headed in the opposite direction. The Blues, Blackhawks, and Sharks are building momentum out West. While the Avalanche and Ducks are desperately trying to right the ship. The Anaheim Ducks fired head coach Randy Carlyle. Rumor has it they’re interested in bringing in Gordon Bombay. Sidney Crosby passed Mario Lemieux for the most games played as a Penguin, although his other statistics aren’t nearly as impressive as the big guy’s. Roberto Luongo passed Patrick Roy for the 2nd most games played for a netminder in the NHL, only trailing Martin Brodeur. Elias Lindholm explains his mockery of the Hurricanes’ Viking clap celebration, plus has recorded the most points of any player playing on a new team this year. Not the most impressive stat until you consider John Tavares is playing his first season for the Maple Leafs. Elias Pettersson keeps lighting the lamp at a remarkable pace, scoring 25 goals at the fastest pace since Alex Ovechkin in 2005-’06. And did you know Auston Matthews leads all NHL players in 5-on-5 goals since the beginning of the 2016-17 season with 70 in 185 games?! McDavid has 69 in 217 games, Skinner has 67 in 215 games, and Ovechkin has 64 in 217 games. Did you see Crosby’s questionable, widely considered dirty, play on Tyler Johnson? Was this a dirty play by Sid? Or the penalty shot in the Swiss League where the eventual scorer skated back towards the red line to retrieve a puck he lost but maintained forward momentum? Should it have counted? And how about the speed of McDavid’s hand in warm-ups? 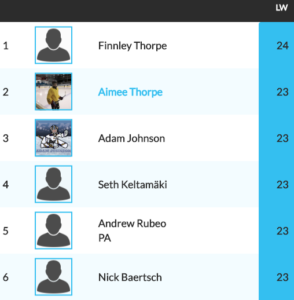 Finnley Thorpe won the $20 HPC gift card, scoring 24 points last week, while 5 others found themselves one point back on our Weekly Picks Leaderboard. Schwartz and Rubeo’s old college teammate, Mike McMullen, is leading the HPC pack for February so far. Of course, he couldn’t avoid the chirps of his old teammates but will win a free HPC XV3 hockey stick if he maintains his #1 ranking. Don’t forget, take 60-seconds to submit your Weekly Picks for a chance to win a FREE $20 HPC gift card (for weekly winners) and Hockey Players Club XV3 hockey stick (awarded to monthly winners). And no Hockey Players Club Podcast would be complete without a round of Top Shelf Trivia. Schwartz took over this week’s duty with Elias Pettersson‘s goal production and age in mind. It was a tough one, even mostly stumping our resident nerd, Kittelberger. Please follow and reach out to the Hockey Players Club via Instagram, Facebook, and Twitter to submit your questions and comments to the HPC podcast crew.